Trends & Insights are written by respected leaders in the field of international education and from our extended community. These articles highlight social, economic, political and higher education system trends affecting international higher education. Enjoy access to the most recent issues of Trends & Insights. 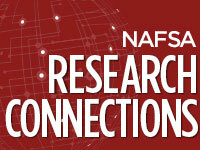 Access to the Trends & Insights archives is available only to NAFSA members. Login or join today. These articles are copyrighted by the author and NAFSA. Although downloading or printing for personal use is encouraged, systematic or large-scale reproduction is strictly prohibited without written permission of the author and NAFSA.